A few years ago, when my daughter was in kindergarten, she gave me a wonderful Mothers Day gift. It was a necklace with a bead that looked like the Earth and a card that said.. "You Mean The World To Me!" 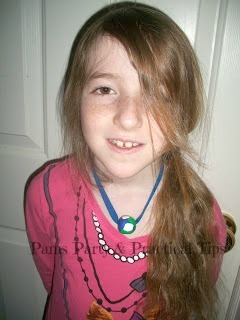 I really love that necklace she made when she was 5, and since then we have made several more. Last year for Earth Day, our school had a special interest day where we learned about being green. As a gift to her class, we made beads for every child in the class to wear that day. The kids loved them. 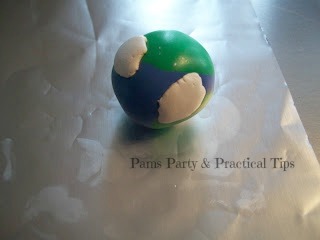 With Earth Day coming up again next week, I thought this would be the perfect craft for this week's tutorial. 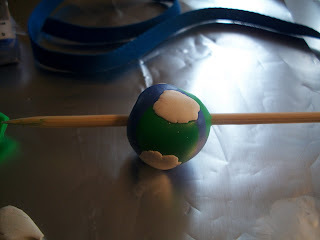 To make an Earth bead, you need blue, green and white polymer clay and your favorite ribbon or string. We went with just a basic blue ribbon. Take a small section of blue and shape into a circle about the size of a quarter. 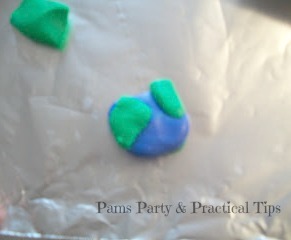 Take 3-4 smaller pieces of green and place them randomly on the blue clay. 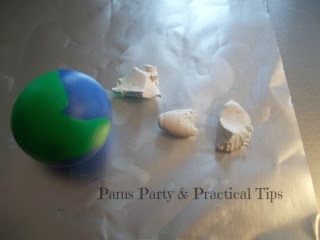 Break off small pieces of white clay. These will be the clouds, so size to your preference. You might want to wash your hands before handling the white clay to keep it really white. 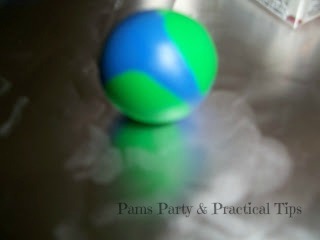 Place randomly on the ball and smooth out. I used a bamboo skewer to make the hole, but many things would work. I removed the skewer before baking. Bake at 270 degrees for 15 mins, and then let cool. 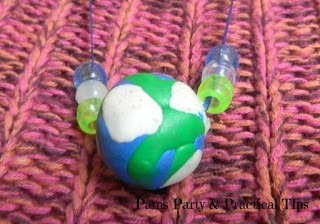 If you like you can add small pony beads, other earth beads or just wear alone. This is such an adorable idea. Love it! Really cute! My 5th graders would really enjoy it too. Thanks for sharing! Awww! How stinkin cute is that? What a great way to celebrate Earth day! Thanks for sharing with the Pink Hippo Party.. can't wait to see what you share next week! That is a great project! My daugter would love to do this. Earth Day is one of our favorite days of the year for me and my 2 sons. I'm going to try to attempt a necklace like this. Thanks so much for the idea! I have a weekly linky party called Terrific Under Ten Tuesdays. It's for projects made for $10 or less. I would love for you to link up sometime! Neat! My daughter loves to make her own beads, but we've never used FIMO. Thanks for sharing your great idea! My kids and I are going to make these today. Great idea. My daughter would flip to make her own bead. Thanks for the idea. Thank you so much for linking up to Strictly Homemade Tuesday. I hope to see you back next week!! What a great Earth Day Project! Thanks so much for sharing at the Tuesday To Do Party! Thanks so much for linking up to Terrific Under Ten! I just love this project! Happy Earth Day! I featured your necklace today on my blog. Come grab a button! Saving this idea for next year! I know I'm late commenting but this is a great idea! Thanks for sharing!